Sugan is a hand-braided rope made of straw, usually used for seat covers or cheap saddles. In this case, the resourceful early farmers of Solebury harvested their grain and then used the remaining stalks of straw to weave their grain sacks. I had a film professor named Adolphus Mekas who grew up in rural Lithuania before World War II. When telling us about his childhood, he would always bring up the hours upon hours his family spent braiding rope in the evening. I imagine the early settlers of Solebury had a similar experience, forced by their remote location to manufacture any materials they required. We now pronounce Sugan as “soogan,” but my grandfather tells me it used to be pronounced “soogun.” The change occurred when they installed the first phone lines. To place a call at that time, you had to speak to the operator and ask them to patch you through on their switchboard by street and number (ex. “Sugan Road 55”). A few houses shared the same phone line, and a call to one house would ring in all of them. To distinguish between houses, the operator could employ a pattern of short and long rings. Because they shared the same line, however, the telephone was not considered a private means of communication. Any snooping neighbors could pick up their own telephone and listen in. Due to the poor audio quality of the phone lines, the operators at the telephone exchange in Doylestown found it easier to enunciate the second syllable of Sugan as “gan” instead of “gun,” and eventually their incorrect pronunciation replaced the original. In this way Sugan Road, originally constructed to accommodate Solebury’s agricultural infrastructure, was re-named to accommodate its communications infrastructure. The mill race ran from the stone platform on the left to another platform next to the mill house. From there it ran into the chute (you can see its rotten end sticking out of the building) and poured over the wheel. The property is full of these metal plates. Some line the creek and mill race, others are in open ground. My grandfather says they were installed to keep muskrats from burrowing into the banks. A number of years ago I was walking around the woods next to my family’s farm, now owned by the Audubon Society, and I found something odd. 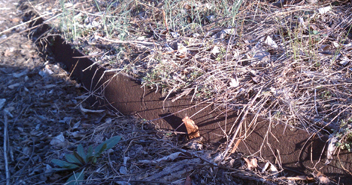 The upper part of the creek was full of metal plates, long strips of rusted metal jutting out of the ground, some lining its banks. There was also a raised square block of cement with a manhole access point on top. I asked my father about their origin, and he told me that the embezzler that owned the property had rerouted the creek to operate his mill. 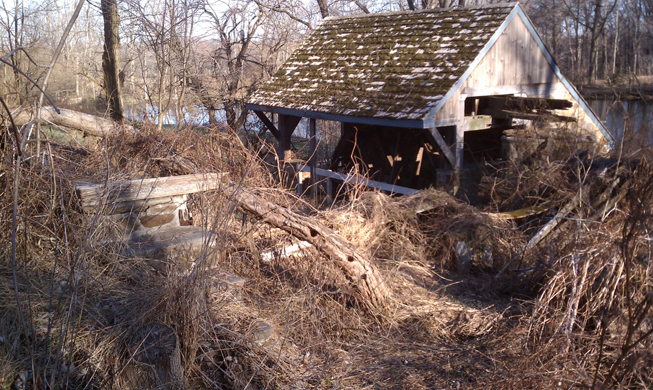 I didn’t think much more of it until this year, when I moved into the property’s carriage house, a stone’s throw from old water wheel. I began to wonder, who was the man who commissioned this project? Robert Joseph Boltz was born in 1886 to a wealthy and highly respected family from the Germantown area of Philadelphia. His first ambition as a young man was to attend West Point, but he was denied entry due to color blindness. He then dabbled in a series of career paths that he never quite took to. He studied engineering at MIT, ran his family’s Cuban cigar business into the ground, and studied law for a couple of years before getting into the business of real estate law. In the late 20’s he started playing the stock market and discovered his true calling: the Ponzi scheme. He opened up shop as an investment counselor in downtown Philadelphia and easily found investors among his friends in Philadelphia high society, eventually swindling 160 “clients” out of more than $2,500,000. At first they seemed to be making out okay. When the stock market crashed, he was still able to make payments to his investors out of their initial capital. Eventually the SEC got wind of his activities and, knowing his game was up, Honest Bob withdrew a few grand, drove his wife to Philadelphia, and fled. He was eventually found in Rochester, NY, and arrested. The government was only able to prove their case for $832,000 of the $2,500,000 he stole, and he went to jail until 1956. Between 1934 and 1939 Boltz used his stolen money to purchase 260 acres in Solebury Township, becoming one of the early “gentlemen” to play farm in the township. He once joked to a client that he’d just spent his $1,000 “investment” on a tractor for his farm, and now it was worth only $500. This seems to be how he actually disposed of large amount of his ill-gotten gains; when he went bust, the authorities had a hard time identifying any assets other than the farm. He truly spared no expense on his elaborate estate. The elaborate farm Boltz cobbled together from smaller properties has long since been divided back into smaller parcels. His old house has recently been restored, and the Audubon Society inhabits one of his barns, but perhaps his ambitious project is now in ruins. Walking around the ruined mill I found the remains of the mill race buried in briars, now only recognizable as two stone platforms and some rotten boards. 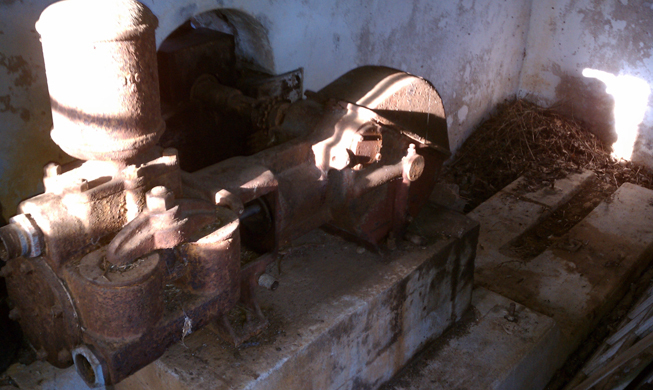 Inside the mill house, I found the old machinery in remarkably good shape after decades of neglect. My more mechanically-inclined brother immediately identified the block of cast iron as a pump. The cement block has room for more machinery, and there are attachment points on the slab. Another piece may be missing. The rotational force of the wheel is converted into linear force by this cam. Boltz was spending fabulous sums of his 260-acre estate overlooking the Delaware River at Solebury, Pennsylvania – he built one corn crib, metal-sheathed against rats, costing $10,000, and there were twenty-two telephone wires connecting his farmhouse, stables and barns. He insisted on an old-fashioned wooden wheel, instead of the more permanent steel, and told Campbell to spare no expense. Campbell first located a stand of Pennsylvania white oak with three-foot trunks and had the trees cut and dressed: water-wheel timber must never be green and always seasoned. The finished wheel was fifteen feet high and thirty inches broad, with a solid white oak shaft twenty inches though the core. The bearing casings, usually made of iron, were of lignum vitae… Soon after this job was completed, but only partly paid for, “Honest Bob” Boltz was arrested on charges of defrauding his customers of more than $2,000,0000 and is now serving a twenty-year jail sentence. Boltz’s water wheel – which cost $2,500 by itself – plus some $35,000 worth of fancy mill races, stone spring houses, antique wooden water troughs, locks, stream moving, and conduit laying that Campbell did for him, were probably financed in the same way. All of his completely bewilders Campbell, who doesn’t see how a man with such taste in water wheels could be a crook. ” I just cain’t understand it,” he says, shaking his head sadly. Since no one else seems much interested now, Campbell sometimes drives forty miles from his office in downtown Philadelphia just to look at his Boltz masterpiece. It is still working steadily at its job, filling a concealed hilltop reservoir with 30,000 gallons of fresh spring water each day. Ultimately, Campbell lost $4,000 on the project due to non-payment after Boltz went to prison. 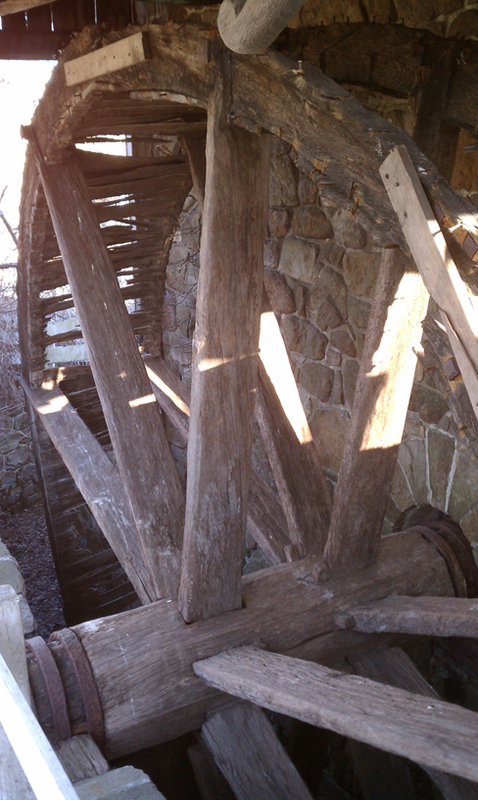 The mill certainly was well made. 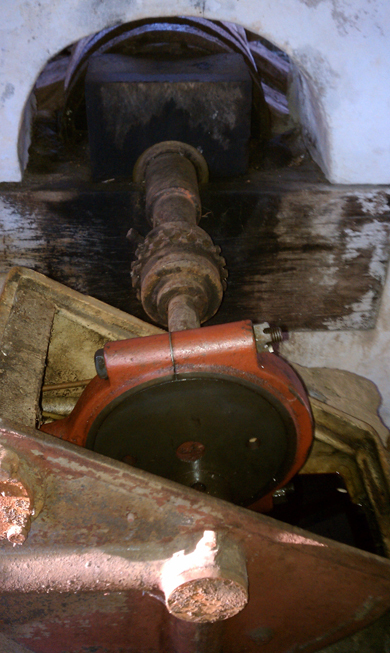 My grandfather says it was running well until the 70’s, when the pond that fed the mill race burst. After it stopped running, it quickly began to rot. 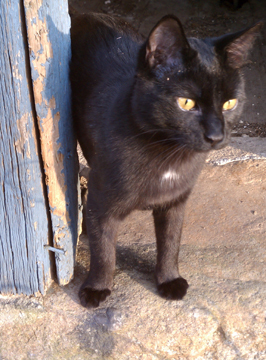 The author's cat exploring the spring house.